English muffin with peanut butter and banana or cold cereal. Turkey or Tuna sandwich, dinner leftovers or a quick salad. Monday - Hot Dogs with cut up veggies for the kids and Mike, this mama is going out tonight! Paint Nite, here I come! Tuesday - Crock Pot Honey Garlic Chicken (freezer meal) served with Whole wheat Couscous and veggies. Wednesday - Breakfast for dinner - Egg sandwiches served with fruit. Saturday - Grilled Kielbasa served with potatoes, onions and veggies. Sunday - Meatloaf Burgers from Mix and Match Mama served with veggies. 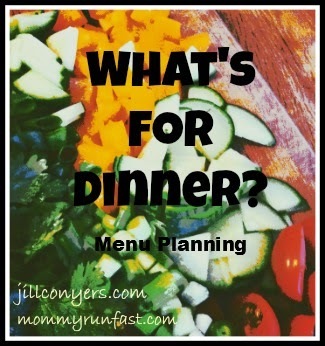 Linking up with I'm an Organizing Junkie and Jill Conyers. Check them out for a whole lot of meal plan ideas! Wish I had known you were doing paint night again! would have joined you! Thanks for linking up (I co-host with Jill) - and hope you enjoy your night out! Thanks for stopping over! Your Stuffed Acorn squash dinner sounds yummy!! I might have to try to find a recipe for something like that! I love doing breakfast for dinner! Isn't it the best! Perfect for a busy night!